One thing is fairly certain, however: it was Taritero who set in motion the creation of "Pakuni," the primitive language spoken by the Cha-Ka, Ta and Sa, the series' three Cenozoic ape-man characters. "At first, we talked about using Pig Latin or English words spelled backwards," recalled Taritero, "but we decided that if we were going to have people speaking foreign sounds, those sounds should be a real language." Bowing to what he termed "teacher pressure," Taritero took the new-language angle a step farther, promoting Pakuni as a potential educational tool. "I decided to commissino a language that would be fun Saturday morning, but then might translate into learning Spanish the following week." He took this challenge to UCLA, where he was referred to Victoria Fromkin, Ph.D., the head of the university's department of linguistics. 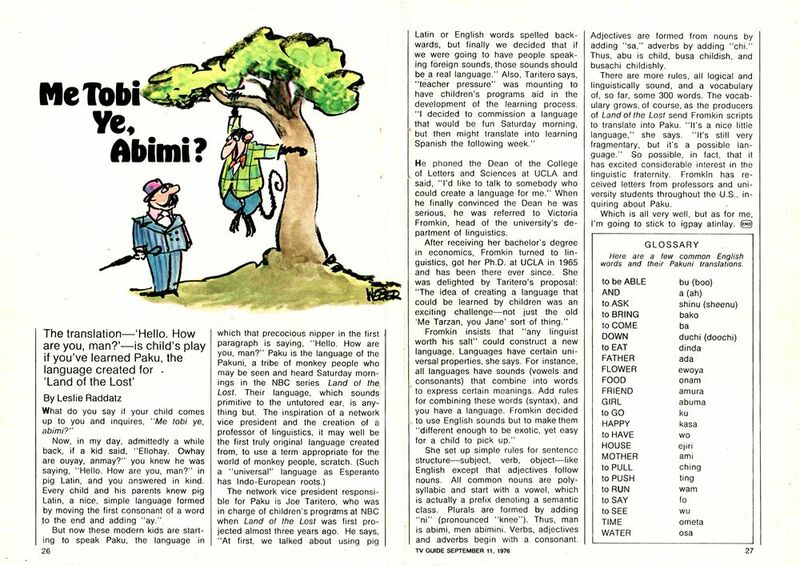 "The idea of creating a language that could be learned by children was an exciting challenge," remembered Dr. Fromkin, "Not just the old 'Me Tarzan, You Jane' sort of thing." Fromkin also wanted to avoid the quasi-English "foreign" tongues used on such TV programs as Mission: Impossible. Pakuni would be literally built from scratch, without any Latin, Slavic or Anglo-Saxon roots. First off, Fromkin established a common ground between the new language and existing ones: sounds (vowels, consonants) and syntax (rules for combining words, like "subject-verb- object"). Two rules were also established early on: Pakuni plurals would be created with the addition of the suffic "ni"; and, unlike English, Pakuni adjectives always followed nouns. duchi or doochi (down); ejiri (house); ewoya (flower); fo (to say); kasa (happy); ku (to go); ometa (time); osa (water); shinu or sheenu (to ask); ting (to push); wam (to run); wo (to have); and wu (to see). The meticulous Nels P. Olsen, whose superb Land of the Lost Internet website cannot be praised or recommended too highly, has combed through Land's 43 episodes and come up with even more frequently used Pakuni words and phrases, which he has grouped into pronouns, nouns, verbs, adjectives, adverbs, "question words" (mechi = please, sa opari = why) and "answers." One byproduct of Olsen's diligent research is the revelation that, in certain instances, Fromkin didn't stray all that far from English: "me" or "meni" means "I," "ye" means "you," and when the Paku say "no," they mean "no." Upon completion, each of the Land of the Lost scripts were submitted to Fromkin, who would then "translate" the appropriate phrases into Pakuni. For her efforts, she was highly praised by educators, linquists and parental groups. (NBC's censors, however, were not quite so free with their praise, often demanding full translations of the Pakuni dialogue for fear that Fromkin might have slipped in a few expletives!) As to what the younger viewers thought of Pakuni ... well, we'll get to that later. That many of the preteen fans of Land of the Lost were more fascinated by the special effects and Sleestak and Paku costunes than anything else wasn't exactly what linguistics expert Victoria Fromkin had in mind. It would have been incarnate proof of the series "educational" value had the kids at home begun spouting fluent Pakuni to their friends and family, and thereafter applying the learning skills they had accrued from TV in the schoolroom. But while some middle-aged devotees of the series can recite Pakuni words and phrases on command, the new lingo didn't exactly catch on like wildfire back in 1974. The one phrase that enjoyed the widest circulation was "Me tobi ye," which translates to "I welcome you" or "I greet you." Despite the underwhelming response to Pakuni, however, NBC's committment to Dr. Fromkin remained steadfast throughout the series' 1975-76 season. 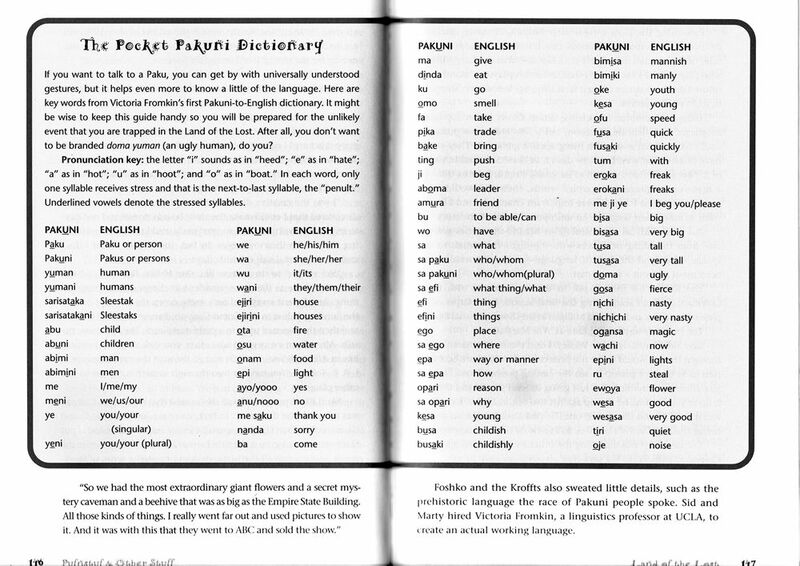 Notice that page 4 of this university level linguistics test contains references to the Pakuni language.